The Indiana Glass Company was established in 1907 when an early 19th century company called Ohio Flint and Glass Company was sold to the National Glass Company combine. This glass plant was located in Dunkirk, Indiana. When management finally stabilized the company became The Indiana Glass Company. 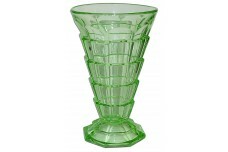 The company was known for their industrial pressed glass. They produced mainly auto auto head lenses. Indiana cornered the market in this area and was responsible for the bulk of the head lens sales. 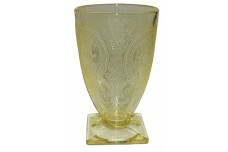 With this huge success they began to branch out into other areas of glass making as well. Indiana began its venture into other areas as a hand made glass factory making Soda Fountain items, restaurant ware, and crystal ware. They were successful in establishing a good clientele and continued to grow. 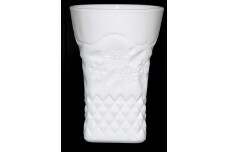 Over time they changed their approach to making glassware to stay ahead of their competitors. Indiana introduced color in the 1920s. They made several colored pressed patterns that were well received by the public. Automation arrived and Indiana redesigned many of their patterns and shapes to accommodate the assembly line. 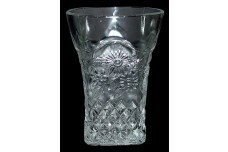 However, they continued to make both hand-made and machine made glassware. 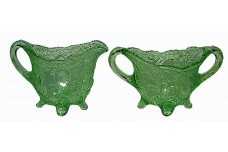 Some of the most popular Depression Glass patterns produced by Indiana were Avocado, Tea Room, Sandwich, #612 Horseshoe, Indiana Custard, and Pyramid. Over the years Indiana has continued to use its antique and early molds. 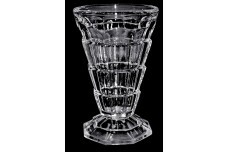 From 1970 until 1998 they furnished a subsidiary called Tiara with glassware for home parties. 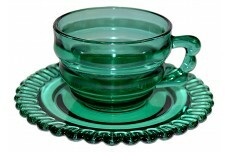 Pieces of Pyramid, Avocado, Sandwich, and Tearoom were re-introduced in new colors. The Lancaster Lens Company and Indiana Glass merged in 1955. In 1962 Indiana became part of the Lancaster Colony Corporation. Today Indiana still makes both hand made and machine made glassware. 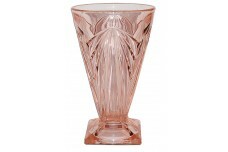 Most of their production is limited to vases and accessory items for use in florists shops, homes and automobiles. The actual production is done in a factory in Sapulpa, Oklahoma. The finished glassware is stored in both in Sapulpa and in Dunkirk, Indiana.